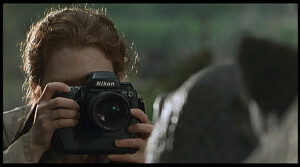 The Nikon F5 has appeared in a number of movies and advertising campaigns with varying success and exposure. Most notably was in the movie Vertical Limit where in the hands of climber and National Geographic photographer Peter Garret, rare Snow Leopards are documented in the high mountains of Pakistan. Single digit Nikons are a big occasion and worth making a lot of fuss over. Though, as they are aimed at the pro’s, guys and gals who already know what they need, they could probably sell themselves. The return to Jurassic Park sees both Julianne Moore and Vince Vaughn carrying numerous F5 and F100 bodies as they trek through the island jungle in search of prehistoric creatures, documenting their behaviour. The story of a talented photographer who lands a lucrative job in Paris with a scandal-mongering tabloid. She becomes romantically involved with an eccentric children’s book publisher whilst resisting the advances of another photographer. There is perhaps no better or more fitting advertisement of the F5 than the one given in the mountaineering blockbuster Vertical Limit. Actor Chris O’Donnell plays a National Geographic photographer whom is on assignment documenting Snow Leopards in the Karakorum Ranges of Pakistan. Keeping quiet in a make shift hideout, his well-used F5 blasts away frames on Kodak film. Robert De Niro plays a once retired criminal whom is lured back for one last job. 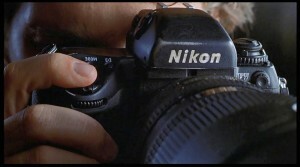 Using an F5 and 180mm f2.8 ED IF AF for surveillance there’s no hiding that big white Nikon logo.